AuCuTee Fan White Noise Machine Just $23.99 PLUS FREE Shipping! You are here: Home / Great Deals / Amazon Deals / AuCuTee Fan White Noise Machine Just $23.99 PLUS FREE Shipping! There is nothing better than waking up after a good night sleep. You’re refreshed and ready to face the day. A good night’s sleep will not only make you feel rejuvenated, it will also help to reduce stress, which in turn improves your outlook. However, as you grow older, you may notice that it is tougher to fall asleep at night. There are even times that no matter what time you go to sleep, you will find yourself waking up in the middle of the night. If you are having troubles falling asleep or you are easily awakened at night, using a white noise machine like the AuCuTee Fan White Noise Machine can help. You can get this AuCuTee Fan White Noise Machine for only $23.99! Just make sure to apply the extra 25% discount coupon located below the price. This price will take it down from $31.99 PLUS FREE shipping to just $23.99 PLUS FREE shipping! 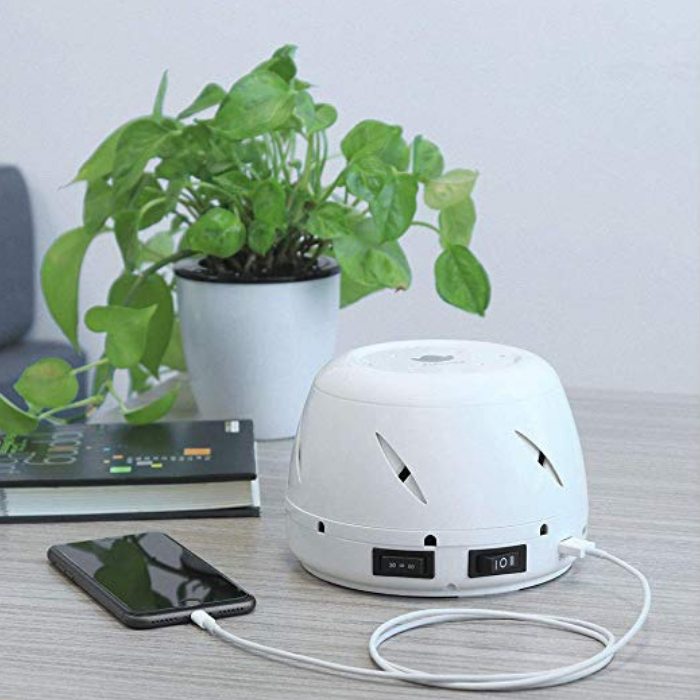 The AuCuTee Fan White Noise Machine is an effective way to balance out all the sounds around your room and help you get the blissful night’s sleep that you’ve been dreaming about (pun intended 🙂 ). It features a real fan that generates natural and non-looping airflow of white noise for you to focus, relax, and sleep. Uses a real fan. Instead of an electronic recording, get the soothing fan-based sound that does not change, break or loop. Gives out a rushing air sound that is soft and pleasing to listen to yet it is strong enough to mask the outside noises that keep you up all night. Leave the sound on all night or choose 30/60 minutes automatic shut-off timer. Has dual fan speed: Choose high speed to make loud fan sounds or low speed if you want a more quiet environment. Just flip the switch to high or low and customize the volume and the tone. Comes in a compact and elegant pearl white color and design that fits anywhere and blends easily into the surrounding. Has Dual built-in USB charging ports with DC 5V/1A that can be used to charge your cellphones or tablets. Can be used not just for sleep but also to block any unwanted disruptions and provide you with a soothing and relaxing environment.